Home and back on track! The dreaded time came this morning… stepping on the scale after a full five days of eating everything but FD approved foods (well, almost) coupled with wine every day! Drum roll….. NO CHANGE! So relieved that the number is the same more or less. I always fluctuate 1-2 lbs, I’m right in the middle. I hadn’t expected it to go down, besides I’m not trying to lose weight anyway at this point. I also worked out pretty hard while I was away which I’m happy I managed to do. Sometimes I think my body is too good to me, I really thought I would see a number I didn’t like when I returned!! I also feel back to normal with regards to tightness this morning. I arrived back to NY on the red eye yesterday morning and still managed to go to the gym to work chest and triceps, which I’m proud about. Of course, knowing that today I am TWO WEEKS from show time helps on the motivation!! I received my polygraph test notice this morning, so I have to schedule an appointment to get that done. Things are becoming more real now, and I have my last session with my stage coach, Janet, on Monday. I will need to really step things up and practice on my routine, which I’m still not that confident about. I also made some alterations on my suit, because the string was too short and pulled my bottom up too much and I felt I looked like a stuffed sausage in it (although I hear sometimes that is normal, lol). My strategy in the next two weeks is as follows: Follow my diet this next week in a normal fashion (after all, Fighter Diet is as good and better than any strict contest diet! ), then the last week I will cut down on fibers, meaning not eating pounds and pounds of vegetables at each meal and also not too much wheat bran in the morning. I have yet to decide when to do a re-feed, I feel I need a good 6 days at least with regular meal schedules before I can do that. At any event, I won’t be doing it too close up to show day but several days before. Today is leg day and I’m psyched to be back in my normal setting, and in my own gym. I’ve discovered that although I’m an explorer, I do enjoy routine when it comes to my healthy lifestyle – it’s when I feel my best. During my week in Napa, I confirmed that my new lifestyle is the way to go. Although constantly tempted by food and wine, what tempts me more is to look and feel as great as I can possibly look and feel. It is this feeling I will hold on to, not just in the two coming weeks in front of my competition, but for the rest of my life. 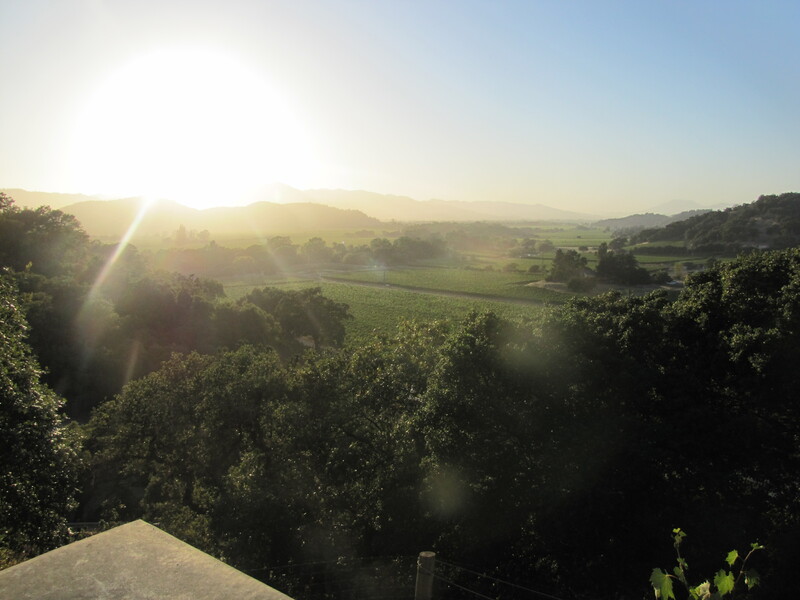 I leave you with one of my favorite pictures of the Napa Valley, taken from top of the Silverado Vineyard at dusk. Miss you, Napa – but it’s also good to be home!